I have always loved travel. I dream of full time travel with my husband. I dream of “road-schooling” my children, broadening all of our horizons, and seeing the world. I have done a fair amount of travel, and I want to share this passion with my kids. My husband, Andrew Pain, has lived the dream (taking a year off to see North, Central and South America by motorcycle.) He currently writes and presents about leaving it all behind in order to travel. Somewhere I get stuck, though, as I stay behind yet again. Here I sit as Andy travels to present on motorcycle travel. Last week to Horizon’s Unlimited, and this week to Overland Expo. He’ll have the opportunity to chat with amazing people who have taken the plunge to live boldly and explore the world in ways that many only dream of. I don’t blame Andy for leaving me behind-he always wants me to join him. He even offers to stay home with me. Why should we both miss these opportunities? It gets harder and harder for him to leave each time, but I encourage him to go. Despite my encouragement, it’s painful to let him go. Watching him drive away dredges up difficult memories of his trip in 2014, when I was going through chemo and too weak to travel with him. I hate allowing health problems to impose limitations on me. Again this year, health issues are forcing me to stay behind. 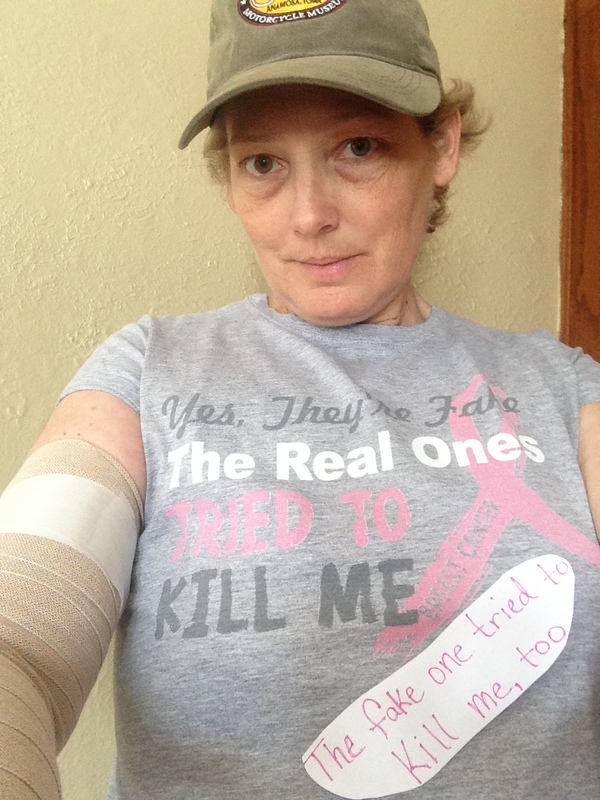 This has been a particularly challenging month, fighting off sickness, pain and lymphedema. The ups and downs in my life are reflected back at me as I browse through my Facebook feed. I think my Facebook feed is becoming Bipolar. On one hand, I am a member of the club that no one wants to join-Breast Cancer fighters/survivors. I’m involved in a number of groups, and these feeds are full of small triumphs, as well as devastating heartbreaks. I often have tears in my eyes when I read the things so many young women are struggling through. On the other hand, I am also a member in a number of motorcycle and travel groups filled with stories of adventure and world travel. Their tales put a fire in me and I dream of adventure. I feel like my Cancer ordeal is over, and I’m ready to move forward to live boldly, yet it always seems some new roadblock comes my way, halting me in my tracks. This week has been depressing to me. All my hard work re-defining my life after cancer took a hit. I am not feeling well. I’ve had several doctor’s appointments, face difficult decisions and the ever-present fear of recurrence. The lymphedema in my right arm has progressed to the point where it is effecting the quality of my life. I learned of a surgery that can help reduce swelling so I went for a consultation with a surgeon at the University of Chicago who does microsurgery called Lymph Node Bypass. Coming out of the consultation, I had more questions than I did going in. He recommends not only the Bypass, but also a very difficult and invasive form of breast reconstruction called DIEP Flap, claiming that the full surgery will give me better success against the lymphedema. More on that in a future post, but in a nutshell, it involves cutting from hip to hip and using all of that fat, skin, and tissue to reconstruct the breast. He can take the lymph nodes at the same time and move them to the area where mine were removed. I had previously decided against reconstruction because I don’t want another long recovery slowing me down, but now I’m unsure. Also, this week, I am back at the cardiologist’s office. I started having an irregular heartbeat a couple weeks ago, to the extent that it was keeping me up at night. I am experiencing shortness of breath-disconcerting because I am in really good shape otherwise. Lately, I feel like I felt after treatment, weak and fatigued. It’s impossible for a cancer survivor to stop fears of metastatic disease from creeping into the imagination. The cardiologist had me wear a Holter Monitor and did blood work to determine if I was in heart failure (I’m NOT) – yay! Why heart failure, you ask, in a young (-ish) triathlete? Chemo and radiation can damage the heart. So here we go with more tests. I have a heart echocardiogram tomorrow. If the cardiologist finds nothing wrong with my heart, then we look to my lungs, with fear of mets heavily on my mind. This is not my plan. My plan is to travel the world with my family. I’m a newlywed and excited about our future. I’m super thrilled about our upcoming “family-moon” to Alaska this summer. Just today, I was reading about a family of four that is traveling the world and homeschooling. They will be at the Overland Expo where Andy is presenting on motorcycle travel. Overland Expo-where I am not going to be because I have too many doctor’s appointments. I would have liked the chance to sit and learn about their experiences. This is my dream. How do I attain this dream when I am trapped in a world of hospitals, medical tests, surgeries, and side effects. I want it all behind me, but it just keeps tripping me up. I refuse to let cancer dictate how I live my life. But how? It all makes me feel a bit Bipolar. Depressed about my health one minute, manic about upcoming trips and a life fully lived the next. I feel a little jealous of those at Overland Expo this week. Those who have found a way to ditch it all and live their dreams of traveling and experiencing the world. Clearly, we all have obstacles and fears to overcome. Life is not easy for anyone. Unfortunately, my obstacles keep pulling me down when all I really want to do is fly. How does one get past that?